Where is The Dancing Bear? Where has Guerschon "The Dancing Bear" Yabusele been!? When he was drafted with the 16th overall pick in the 2016 NBA Draft, he was the talk of the town; the guy who would step in and fix all of our rebounding misfortunes, but since suiting up in green, he's hardly been seen. Danny Ainge and the Boston Celtics' front office stashed him last season, keeping him off of the Cs' 2016-2017 roster. Instead, he played for the Shanghai Sharks of the Chinese Basketball Association, where he played 43 games, averaging 20.9 points and 9.4 rebounds per game. He was a CBA All-Star that season, and was later brought to New England to play for the Celtics' G-League Affiliate, the Maine Red Claws, right before their playoffs began. He played two regular season games with the Red Claws, where he put up 18.5 points and 10 rebounds per night. In the playoffs, he was a bit less effective, but still averaged 12.8 points, 5.4 rebounds, and 2 assists per game. He helped the Red Claws defeat the Indiana Pacers' affiliate team, the Fort Wayne Mad Ants in three games, but in the next round, the Red Claws were swept by the Toronto Raptors' affiliate team, the Raptors 905. In the G-League, playoff matchups are decided in a three game series. Yabu was set to play significant minutes this season, but in May, he underwent surgery to remove bone spurs from the tops of his feet. This obviously sidelined him for a while, and he was unable to play for the Celtics' Summer League squad. Not being able to play this summer surely hurt his best betting offers stock, especially on a team filled with youth who were competing for minutes. While he was healing on the bench, Danny and Brad Stevens were able to evaluate the other young guys, to see how they'd fit in the Celtics' game plan. 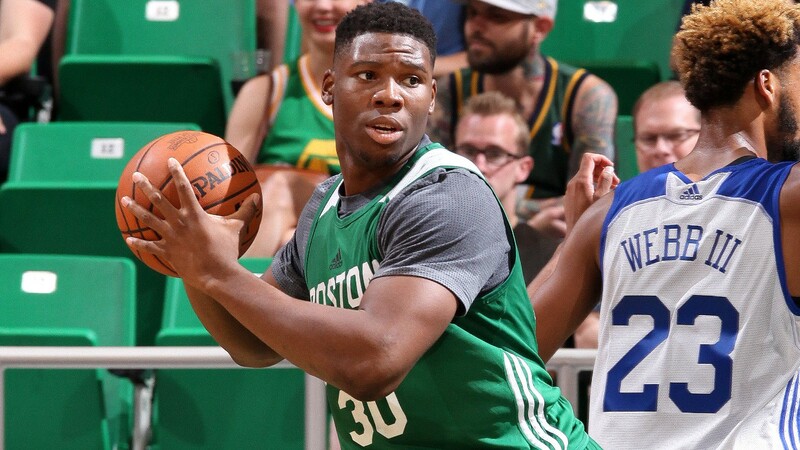 With Yabu out of their minds, guys like Semi Ojeleye and Abdel Nader have gotten more looks to begin the season. Yabusele saw the floor for the first time as a Boston Celtic the other night against the Philadelphia 76ers, but only played for three minutes. In the Cs' next game against the New York Knicks, he saw even less playing time. He was on the court for only two minutes before being pulled. He scored three points in his NBA debut, and then dropped four points against the Knicks. Then just last night, when the Celts faced off against the Milwaukee Bucks for the second time this season, Yabu was nowhere to be found. He didn't log a single minute of game play. Semi Ojeleye, on the other hand, earned 13 minutes of play and was quite effective. He went 0-2 and finished with zero points, but on one defensive play in particular, he shut down Giannis Antetokounmpo. Twas pretty. Asked about defending Giannis tonight, Semi Ojeleye smiles and says, "You always want to go against the best." I'm hoping that Brad is just easing Guerschon into the Cs' game plan, and that it's not a lack of talent that is restricting his minutes. He seems to be a prototype player for this team: a versatile big who can move and shoot. I guess that's not something that this team lacks, as we've seen Daniel Theis and Ojeleye step into this role and play fantastically in the first few games. The basketball betting tips would predict Yabusele would fare well too. Even though our other young guys are filling the need, I'm still antsy to see what Yabu's got. Nothing has satisfied the craving. I'm itching, waiting to see some Dancing Bear. C'mon Brad, I'm like a fiend over here! I need my Yabu fix, pronto!